Brandon Hobson is a recipient of a Pushcart Prize, and his writing has appeared in such places as Conjunctions, NOON, The Paris Review Daily, and The Believer. He is the author of Desolation of Avenues Untold, Deep Ellum, and The Levitationist. He teaches writing in Oklahoma, where he lives with his wife and two children. He is an enrolled member of the Cherokee Nation Tribe of Oklahoma. "A strange and powerful Native American Bildungsroman . . . this novel breathes with a dark, pulsing life of its own." "A dark, twisting, emotional novel about a teenage Cherokee boy dislocated in the foster care system . . . The novel holds a difficult dialogue on intergenerational trauma, the effects of separating children from their Nations, and the perilous outcomes if we do not make urgent changes to the systems forcing American Indians to assimilate and disconnect. This may be set in the past, however, the same cycles exist today, showing that we have not yet learned the necessary lessons to interrupt the trauma." "A powerful testament to one young Native American’s will to survive his lonely existence. Sequoyah’s community and experience is one we all need to know, and Hobson delivers the young man’s story in a deeply profound narrative." "I was really struck by the intelligence of the book, as well as the significance of the story that he's telling, about what it's like to be a modern Indigenous person in this country, as a Native American, and to be in the foster care system. I was very struck by the plot of it—it's very well written, it's very propulsive, it's very readable for literary fiction, and I would recommend it heartily to book clubs." "Imagine a plot hybrid of Dickens and George Saunders​." "A masterly tale of life and death, hopes and fears, secrets and lies." "Hobson's eloquent prose and story line will keep literary and general fiction readers turning pages. Its teen protagonists offer interest for young adults." "[A] poignant and disturbing coming-of-age story . . . Hobson presents a painfully visceral drama about the overlooked lives of those struggling on the periphery of mainstream society." "Hobson's gift to the reader is the hopeful persistence he instills in Sequoyah, despite his challenges with identity and belonging. He is a young man who is clearly scarred but thankfully not defeated." "In Where the Dead Sit Talking, Hobson is once again in fine form, delivering a lyrical, somewhat brutal, and very touching coming of age story set in rural Oklahoma in the late 1980s. At once elegant and straightforward, poetic and cold in a way that approximates noir . . . a beautifully written novel." ​​"Intriguing . . . Hobson has written here a dark and arresting tale." "Weird and intimate, like Ottessa Moshfegh's Eileen, Where the Dead Sit Talking takes us to a strange, dangerous place normally kept hidden. From the opening hook, with the unhurried authority of a master, Brandon Hobson initiates the reader into the secret lives of lost and unwanted teenagers trying to survive in an uncaring world. Creepy, sad, yet queerly thrilling." 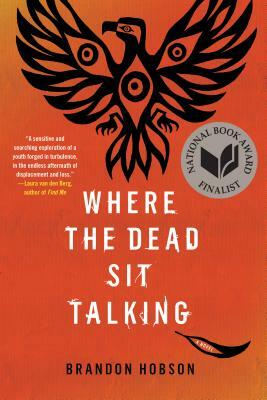 "Where the Dead Sit Talking is a tender and unflinching look at shell-shocked young lives as they try in the eddies of foster care to keep their heads above water. Hobson writes with a humane authority but without giving his characters any alibis. What we have instead is a careful look at what it means to be physically and psychically scarred, abandoned by parents, Native American in a white world, haunted by death, and on the verge of becoming an adult. A wonderful, harrowing novel." "I fear and ferociously admire everything Brandon Hobson creates. He is the only person who can describe the way an object becomes whole when we have enough time to look at it or the presence of a loved one in the air even after she is gone. In this heartbreaking and vital novel there is an unconfessable world of pain, desire, and longing. A careful oscillating dance around avoiding the pangs of abandonment and wanting to go through them all at once to get the suffering over with. Sequoyah, his scars, and eye makeup will leave you with wide eyes and a brimming heart." "One of those novels that comes around rarely in Native American letters, one that quietly changes everything."